“I have this vision of a caveman reaching for a piece of wood to collect water or food. Sturdier than raw clay and more malleable than stone, a wooden bowl is what I imagine him using.” The words of Andrew Pearce make a lot of sense with regard to today’s trend and his company’s aesthetic. 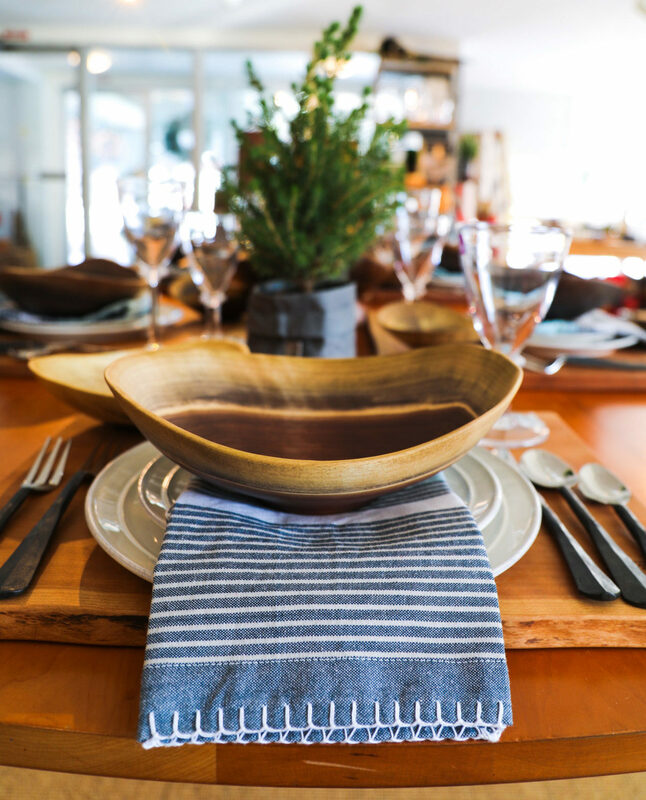 Customers are drawn to Andrew’s wooden bowls – their untampered grain, smooth finish, and elegant curves. More so, we find ourselves captivated by the beauty of this raw material. Wood in itself is utterly stunning, and Andrew Pearce bowls pay homage to this fact. 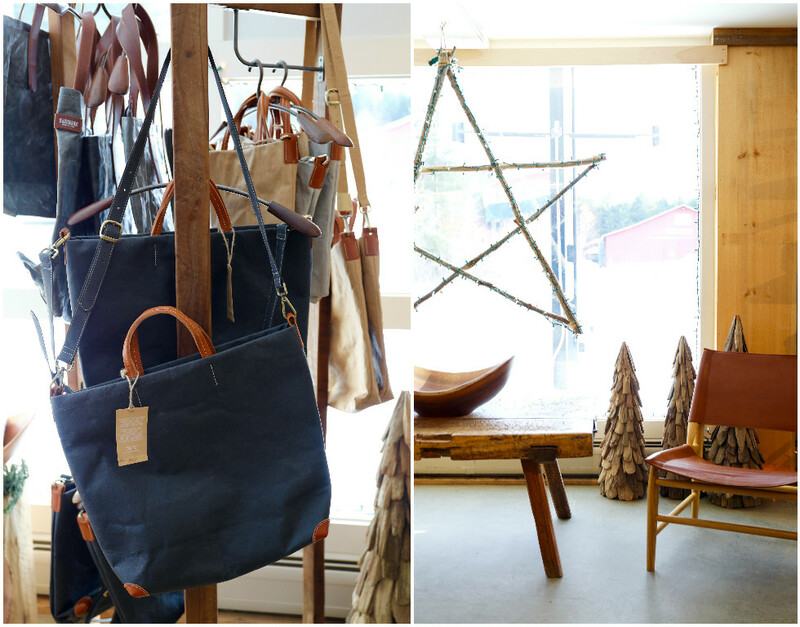 The Andrew Pearce store in Taftsville is composed and tranquil. Andrew’s wife, Christy, equates the space to a gallery. 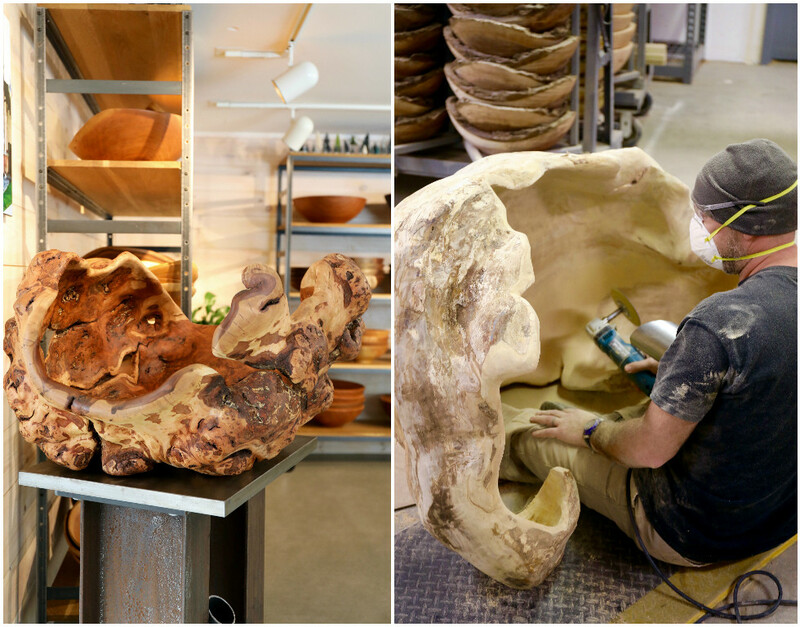 “We wanted the retail store to be clean and simple to display our goods as pieces of art.” So many pieces in the retail store are one-of-a-kind, they deserve some individual attention (this includes the extra large bowls pictured below). An open space with crisp white walls, cement floors, and natural light provides the perfect showcase. 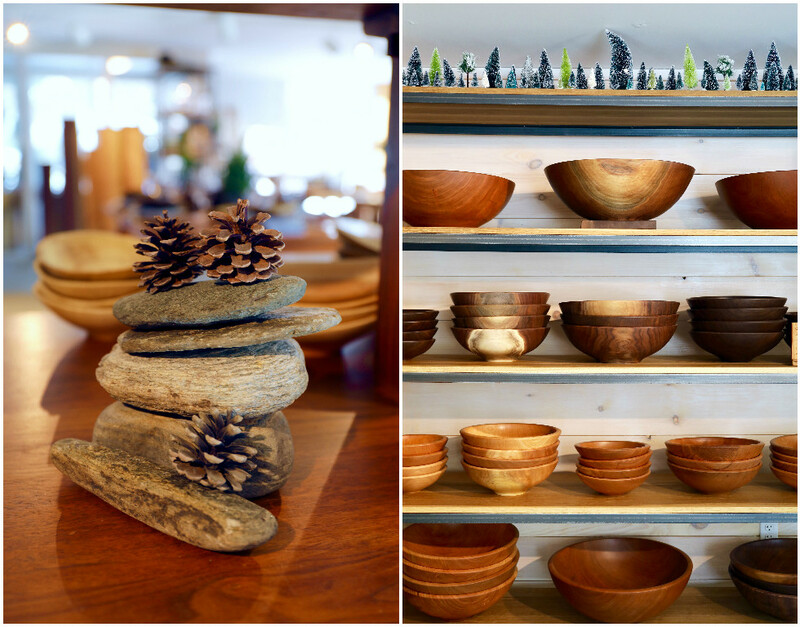 In addition to black walnut and cherry wood, Andrew and Christy have added a few additional artisanal touches throughout the store. One of which is Uashama, an Italian sister duo who specialize in washable paper that washes like fabric yet holds its form. Andrew Pearce is the only retailer to carry this brand’s bags, wallets, and buckets in the Northeast. 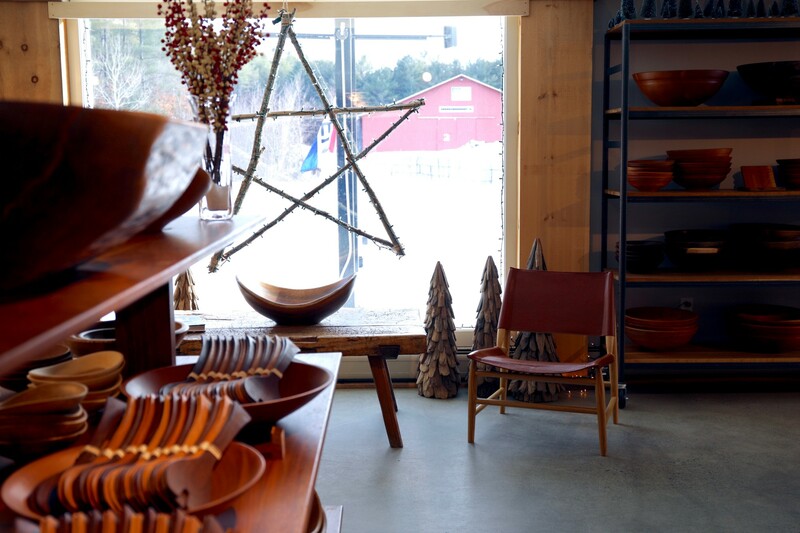 Mid-century leather chairs, textiles, and other tableware accessories don the store’s shelves – all contributing to the art gallery aesthetic. Andrew was undoubtedly raised in a creative environment. 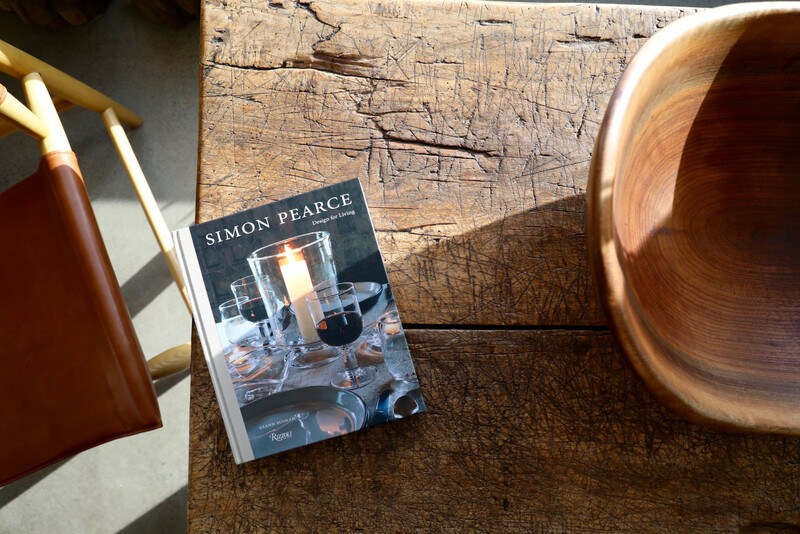 His father is the mastermind behind Simon Pearce glassblowing, after all. An entrepreneurial spirit seems to run in the family, and Andrew felt a familiar pull to start something of his own and driven by passion. Andrew worked alongside his father for 10 years at Simon Pearce. There, he enjoyed working with his hands and building machines. 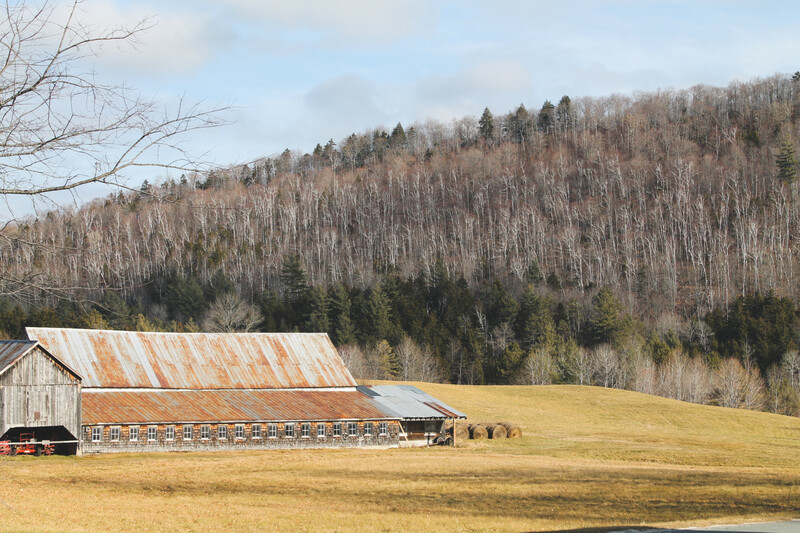 On one occasion, Andrew visited a wood turning business in northern Vermont that was going out of business after many years of operation. He had an idea on the ride home with his father: hand-turned, hand-finished bowls made with the efficiency of a machine-made bowl. 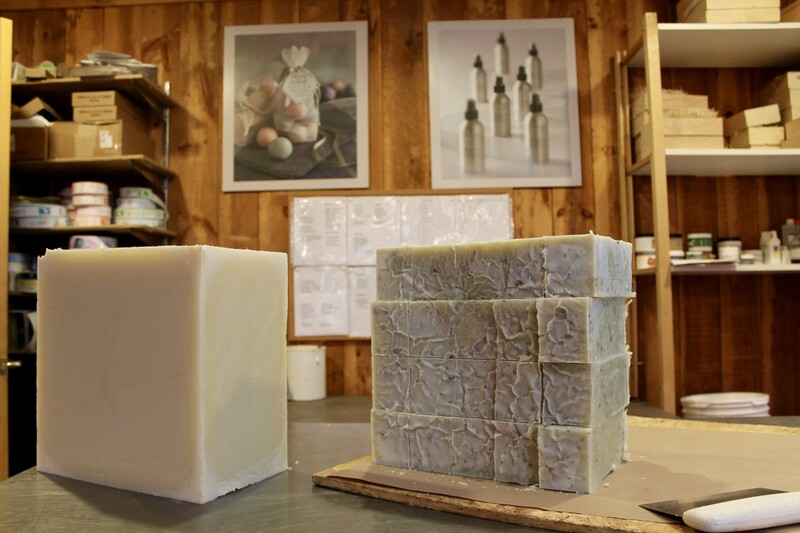 Five years passed until Andrew circled back to this idea.”With a child on the way, it seemed like the right time to start my own family business,” Andrew says. He and Christy dove head first into Andrew Pearce bowls. The key word “efficiency” motivated Andrew to customize his own wood cutting machines. He conceptualized and helped build these machines himself. Andrew’s kiln, for instance, is abnormally large in order to dry hundreds of bowls at the appropriate temperature. Throughout this process, the bowls are carefully monitored and dry in about 35 days (an impressively short amount of time compared to other wood bowl producers). Andrew Pearce also prides itself on its ability to utilize entire logs that are shipped to the workshop. Beginning the process from raw material allows the company to make use of practically all the wood provided. Centers are cut for boards, outer pieces for bowls, and hollowed portions for planters throughout the store. In producing very little wood waste, Andrew minimizes environmental impact and encourages forest sustainability. The careful craftsmanship of these bowls is yet another way in which Andrew Pearce shows respect for the material used. At the entrance of the store, each customer has an opportunity to watch woodturning in action. It’s quite incredible to not only see the end results displayed so beautifully in-store, but to also witness the precise process in person. Andrew grew up eating meals out of wooden bowls, and this tradition has continued with his own family. Walking through the store with me, Christy holds up a 7″ live edge bowl and mentions this is what her children use for cereal every morning. 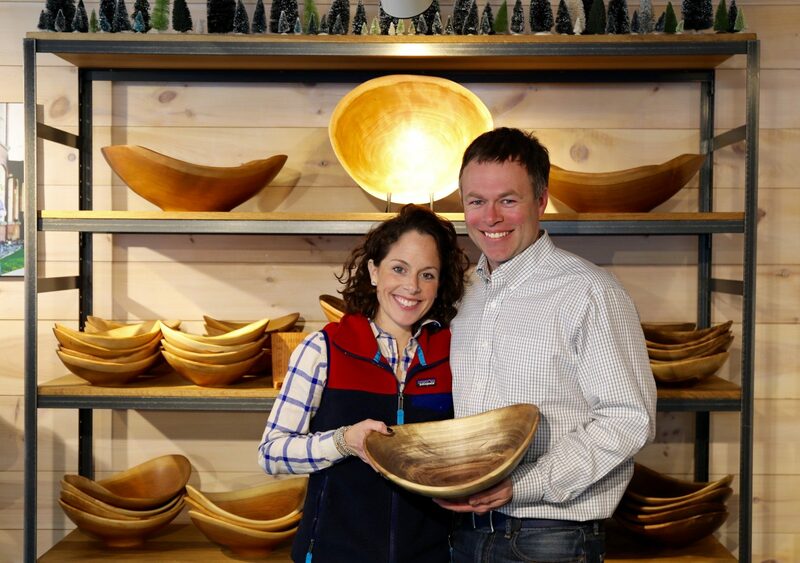 To us personally, this idea brings a whole new meaning to the wooden bowl industry. Not just for display, Andrew Pearce bowls are meant to be used in your every day life. 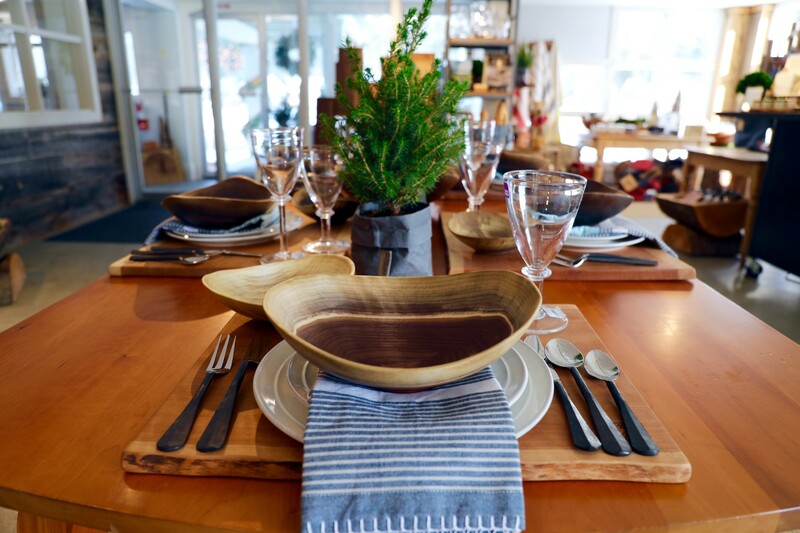 In fact, the retail store houses a gorgeous dining table display on which live edge cutting boards are used as placemats and small wooden bowls for soup bowls. Combining their wood products with curated textiles and Simon Pearce glassware, this table is simply incredible. Andrew Pearce has also added customization to their repertoire. Detailed names, photos, and pattern can now be etched into your own bowl, board, or other wood product. Andrew states that the variety of customizations is extensive. For example, something as oddly shaped as an oar or paddle could be customized if a customer so wanted. Andrew Pearce has certainly entered a whole new level in the realm of registries. With new products on the horizon in 2017, Andrew and Christy are excited to see what this year has in store for them. 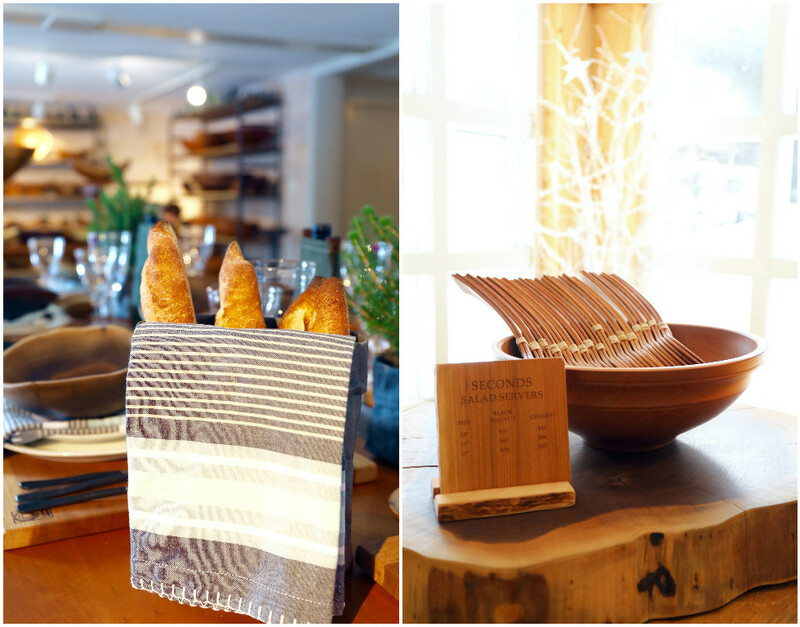 We highly recommend visiting their shop for an up-close look at their artistry – a modern take on a beautifully primal material. 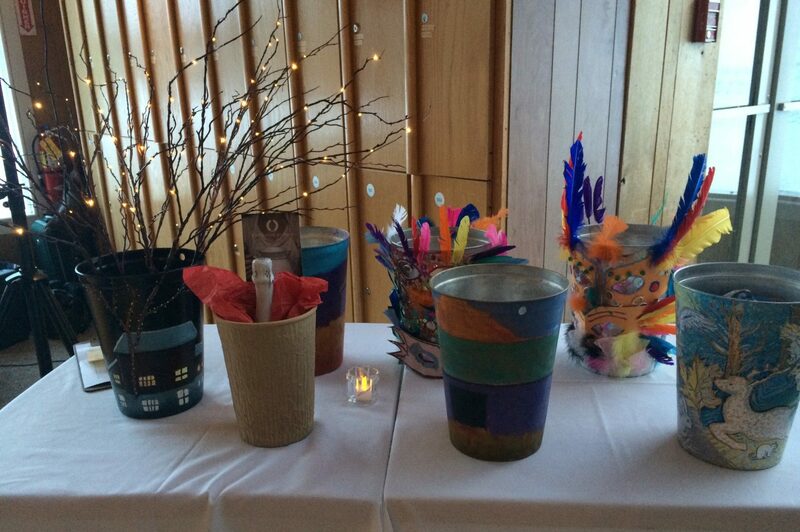 We look forward to displaying our breakfasts in some of these gorgeous bowls in the near future! The Andrew Pearce retail store is open from 10 – 5 everyday. Not in the area? No problem. Many of their goods (including seconds) are available online too!